Molded from soft, pliable plastic to one-half the size of a normal plastic disc case, you can store 2 Dura CD box in every slot of your disc storage unit. I am a huge fan of these CD Cases. I don't like the large ones that have the openings falling off after so much use. I recorded all old family VHS to DVD's, and these were by far the best quality thin case I have ever used. They seal well, and stay sealed. I am a professional videographer. I use these for everything-- weddings, concerts and events. I send hundreds of them in the mail with a cheap 6x9 envelope. No need for bubble wrap to protect hard plastic; they are indestructible. They hold the DVD or CD solidly and snap shut. You can see what is inside so you don't need a separate label. They save space because they are so thin. Highly recommended. They are light weight and cost less to ship than hard plastic. Not to be confused with "Disc Savers" made originally by Stomp. 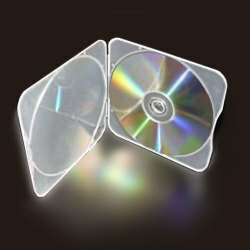 These Dura CD Boxes are thin and open very easily with a edge catch. A good value for the price, especially with free shipping from Shop4Tech. Best used for temporary uses like mailing discs because they are lightweight, or for high density storage because of their thin width. But these cases will open and dump their contents if you drop them at the right angle. The secondary snaps towards the hinge edge don't seem to be doing their job. I also received one that have warped, either from heat or manufacturing defect, so I while I could snap the case shut, the edges bulge open. I wonder how they would last long term? For frequent handling, travel, or long use, consider center button lock plastic disc cases like the square "Disc Savers' or clamshell varieties like Allsop's cd twinpack (for single or two cd storage) that have a good edge catch. They cost and weight a little more, but will hold your discs more securely. CShell even makes a version that can be stored in a 3 ring binder. I switched over my storage from standard DVD cases to these and increased my storage space by a factor of ten. These cases are great--unbreakable, small, easy to open/close and they're see-through to check out what's inside (if you label your disks directly). Highly recommended. I bought these to store my DVD backups in and I can say I'm more than satisfied with the product. They save space and allow DVD/CDs easy accessibility. The price was what first bought my interest and for what it's worth, I believe this was one of the best 11 dollar investments I've ever made. Totally recommend!